NEW YORK, November 8, 2018	(Newswire.com) - ​Phoenix Ancient Art, one of the world’s leading dealers in well-provenanced antiquities, has proven that the treasures of our past are compatible with modern masters, with their innovative display at the Salon Art and Design fair at the Park Avenue Armory. The Phoenix display pairs seven iconic works of modern art side-by-side with classical antiquities. The unique pairings include works by Robert Rauschenberg with a Roman marble statue of a goddess, Marc Chagall and Serge Poliakoff with a geometric Greek stylized bronze horse, Max Ernst and Marino Marini with a Greek black glazed vase, and Fernand Leger’s “Le Fleur” with European Bronze Age fibulae. 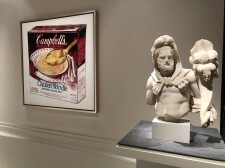 Phoenix Co-Founder Hicham Aboutaam stated, “The juxtapositions of antiquities and modern art are not meant to suggest that contemporary artists literally drew upon antiquities in their composition, but rather to show that great art goes very well with great art across the ages” – referring to a particular Andy Warhol “Campbell’s Soup Box” dated 1985 which was the very first special order by the Campbell’s Soup Company to Andy Warhol to commemorate its transition from Soup Can to Soup Box. 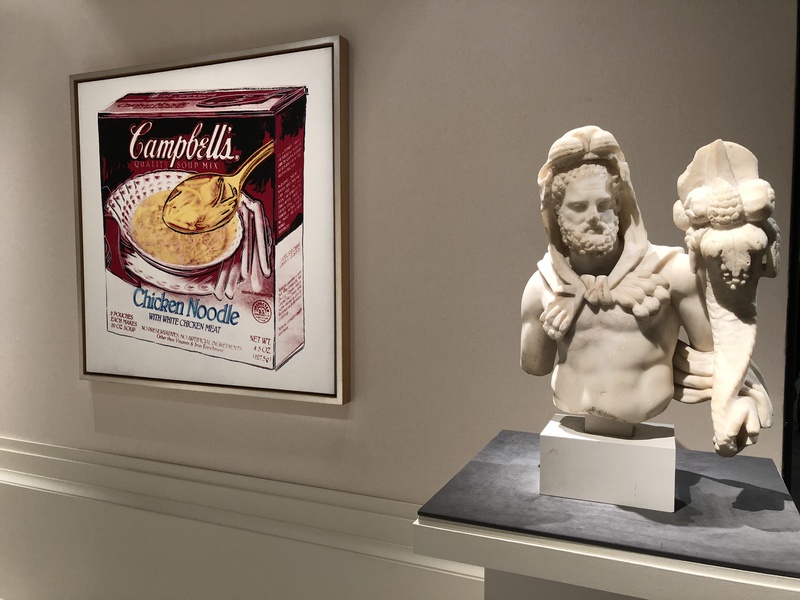 This large 3D executed painting (of a series to follow) of the Chicken Soup Box, coming from the previous prestigious collection of the Campbell Soup Company, can be seen on the wall next to another masterwork of a Roman bust. Mr. Aboutaam noted that this is a perfect prelude for the upcoming Warhol retrospective organized by the Whitney Museum of American Art on Nov. 12 to celebrate his 90th birthday. The Salon Art and Design fair will be open from Nov. 8-12, 2018, stand B5. With galleries in New York City (Electrum) and Geneva, Switzerland, Phoenix Ancient Art is one of the world’s leading dealers in rare and exquisite antiquities with a focus on Greek and Roman, Near Eastern and Egyptian art. Its works of art have been acquired by world-class museums around the world, as well as by private collectors. Phoenix Ancient Art is a second-generation family business that was founded by Sleiman Aboutaam in 1968 and continues today under the leadership of his sons, Hicham and Ali Aboutaam. For more information contact info@phoenixancientart.com or visit www.phoenixancientart.com.